Burnley claimed a third successive draw on the road yesterday, following up the points won at Brighton and Manchester United with this 0-0 draw against Huddersfield at the John Smith’s Stadium. We didn’t get any goals in our last fixture in 2017 but there were certainly talking points. We had a goal disallowed for offside, correctly as it happened, and we were refused a penalty when home goalkeeper Jonas Lössl brought down Jeff Hendrick and you would have to ask the always shocking referee Paul Tierney as to why that wasn’t given. We also, over the game, should have won it, so much better than Huddersfield were we, virtually from start to finish. Our day didn’t get off to as good a start as we hoped. We do like to have a pub stop on the way to away games and one that serves good food. We always do our research ahead of the day but we learned our lesson yesterday to always re-research, more so when it is 21 months since the last visit. It’s changed ownership since that last visit and it was, quite simply, the worst stop we’ve had for a long, long time. We should have been very concerned when, on arrival, we found the draught beers weren’t available but much worse was to come with the food, even the potatoes we ordered were crisps when they arrived (mine were salt and vinegar). I’m not going to name and shame, but if you are travelling through Sowerby Bridge, I’d give the Navigation Inn a miss. We didn’t stay as long as planned so that meant an earlier arrival than expected at Huddersfield. The coffee shop outside the ground was closed and the match programme was a ridiculous £5 but finally a positive with a chat with some Huddersfield fans who are certainly enjoying their time in the Premier League although they were concerned enough to ask me how many points they thought might keep a side up this season. Things improving then. That was until we almost reached the turnstiles. All we had to do was climb the flight of steps and they were right at the top. That seems simple enough but the stewards wouldn’t allow it. They said something about queues but there weren’t any. Finally in, we took our seats (standing area). It was, thankfully, a decent position, nowhere near the front and only just wide of the goals. The players were out warming up and when the team news came through it was, hardly surprisingly, the same starting eleven and the same subs as at Manchester United. Our home game against them ended 0-0 but this was a totally different game. We saw that immediately the teams came out with Huddersfield not including the fleet of buses they parked in front of their goal at the Turf. This was a more open game. Before looking at the game, I was sad to witness the synchronised, manufactured atmosphere at a club I always considered was a real down to earth club. Not any longer, apart from the drum, it’s also a happy clappy place now to be placed alongside Leicester. Those happy clapping things were going strong when Huddersfield fired an early warning with a powerful Collin Quaner shot that forced Nick Pope into a good save, tipping the ball over the bar. I don’t think anyone could have guessed at this point, just a few minutes in, that it would be the last save he’d make all afternoon. But the pattern of the game soon became apparent with the home side having no real answer to the classy Clarets and, if we want to be critical of our team, it was only the lack of goals that could put a negative on the performance. We did get the ball in the net. It came from a free kick on the right taken by Jόhann Berg Guðmundsson which found Kevin Long. His effort was saved by Lössl with Jeff Hendrick hitting home the rebound. It looks as if the assistant has flagged the second effort offside but Long was clearly offside from the initial free kick and so the decision was correct. Guðmundsson, who had a good first half, showed some real quality in one move before firing wide and he set up Steven Defour for another effort which went across goal and inches wide of the far post. It had, in so many ways, been as good a 45 minutes as we’ve seen from the team this season but there is always that concern that things can go wrong if you don’t get a goal when on top. Huddersfield brought out a former player for their half time draw, current Burnley youth coach Danny Cadamarteri. Prior to him coming out, the announcer thanked the Burnley fans for supporting the minute’s applause ahead of the game to remember those involved with Huddersfield who have passed away in the last year. He then went on to tell the entire crowd that they’d just seen exactly why Burnley are doing so well in the Premier League this season. It’s not often you get that from the opposition but it did reflect the first half. If we were concerned that Huddersfield might get back at us in the second half and make us pay, we didn’t need to have any worries. Huddersfield, for all their possession rarely threatened us at all and we had more opportunities to win the game with home keeper Lössl keeping them level with a number of stops both fair and foul. He saved from Scott Arfield and right at the end he denied substitute Nahki Wells a first Burnley goal at his old ground. They were fine, his denying of Hendrick was not and once again we are pointing at referee Tierney. Quite how he failed to see Hendrick fouled for the clearest penalty you are ever likely to see, only he will know. It’s appalling refereeing, of the kind we’ve come to expect regularly from Tierney. Even Match of the Day, for once, agreed that we’d been done and the BBC website read: “The introduction of VAR (video assistant referee) is coming to English football in 2018, but it wasn’t there in time for Burnley in this match. So, the wait for a penalty continues. Our last in the Premier League came last April at Everton while we’ve conceded four this season and you wonder how many of those should really have been given. Embed from Getty ImagesWells, at full stretch, got onto a knock down from fellow substitute Sam Vokes and that proved to be the last chance of the game and so we had to settle for that one point which takes us onto 34. Was it two points dropped? We were certainly the better side and while we can be a bit disappointed that we didn’t win it, we can certainly take a lot from the fact that we were head and shoulders better than another Premier League club. It had, I thought, been a terrific performance that lacked nothing other than a goal. If we can play like that for the remainder of the season there will be plenty more points to come as we go into the new year in seventh place in the Premier League. I’m not sure many of us would have predicted that last January. All that was left on this last trip of the year was to go back to the previously mentioned pub to pick up one of the cars. I can confirm it was the only car on the car park. 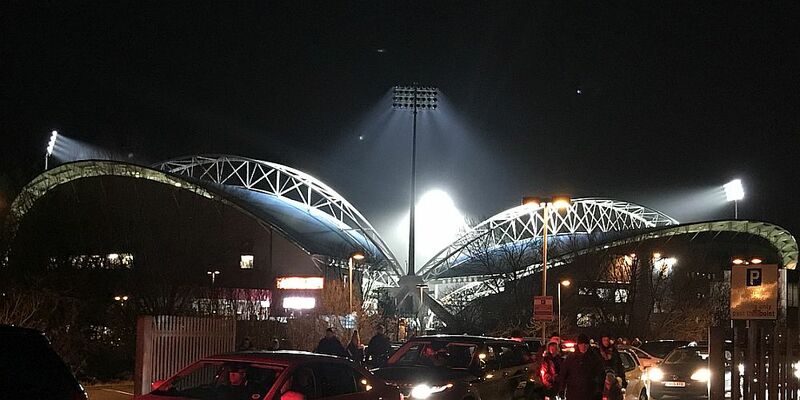 Huddersfield: Jonas Lössl, Scott Malone, Christopher Schindler, Mathias Zanka, Florent Hadergjonaj (Tommy Smith ht), Jonathan Hogg, Aaron Mooy, Rajiv van La Parra, Tom Ince (Joe Lolley 55), Collin Quaner (Danny Williams 82), Laurent Depoitre. Subs not used: Joel Coleman, Michael Hefele, Martin Cranie, Steve Mounié. Yellow Cards: Mathias Zanka, Joe Lolley. Burnley: Nick Pope, Phil Bardsley, Kevin Long, Ben Mee, Charlie Taylor, Jόhann Berg Guðmundsson, Steven Defour, Jack Cork, Scott Arfield, Jeff Hendrick (Sam Vokes 73), Ashley Barnes (Nahki Wells 81). Subs not used: Anders Lindegaard, Matt Lowton, Ashley Westwood, Dean Marney, Jon Walters.